SUPERVIEW is the most basic of the three TransMagic core products; the other two are PRO and EXPERT. As the most basic core product, what is the SUPERVIEW Advantage? Because you’ll have more formats at your fingertips, more viewing tools, a suite of powerful translatiors to open any major 3D CAD file, take advantage of almost instantaneous repair capabilities, and enjoy a wealth of polygon output options and powerful communications options. 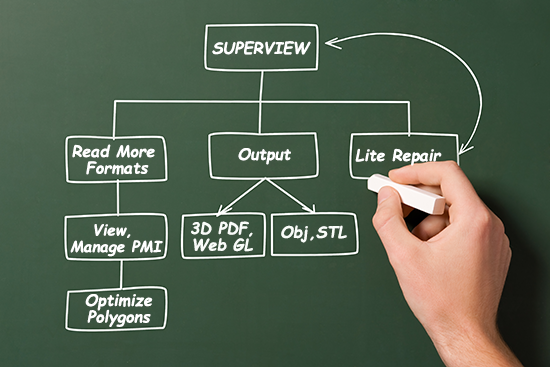 SUPERVIEW allows you to read more CAD and polygonal formats, thus increasing the range of customers you can work with. Depending on which CAD system you use, you will already be able to read some CAD and polygonal formats, but that list will undoubtedly be expanded by adding TransMagic SUPERVIEW’s ability to read all versions of CATIA, now including native CATIA .xcgm files, as well as Pro/E, Creo, UG, NX, SOLIDWORKS, Solid Edge, JT, Inventor, Microstation, AutoCAD, Parasolid, ACIS, STEP and IGES. You can also view Product and Manufacturing Information (PMI) such as notes, dimensions and Geometric Dimensioning and Tolerancing (GD&T) information can also be accessed. 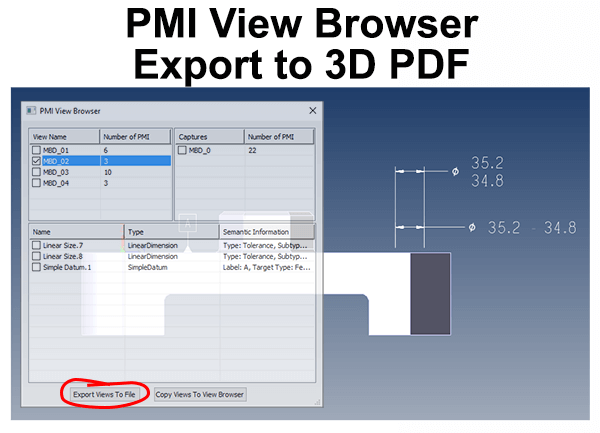 See PMI viewing details on a complete list of supported formats TransMagic products can read on the CAD Formats page. 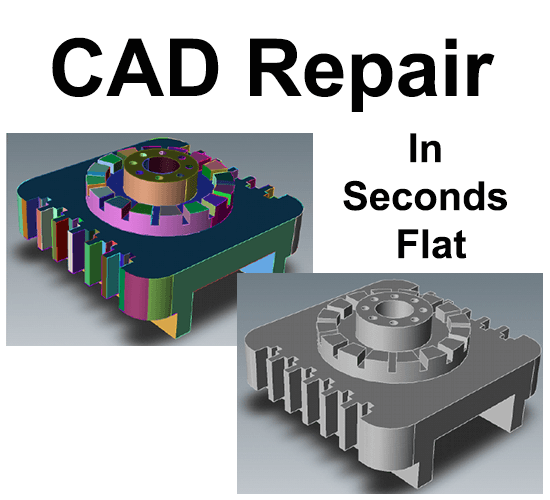 You may already have the capability to read a CATIA or NX file, but almost everyone has had the experience of opening a part or assembly where the geometry was less than perfect. TransMagic licenses its formats from the CAD vendors themselves, so there is no need to reverse-engineer or guess at binary entities. Field tests and benchmarks have demonstrated that TransMagic translation tools are among the very best in the world; we’ve seen many cases where our translators out-performed the translators built into the CAD systems. Having the best possible translator is a massive advantage, since it minimizes the amount of repair or remodeling necessary. Owning a seat of SUPERVIEW gives you one more tool to use in those difficult translation situations. You can setup any view you want, including orthographic views and sections. Dimension, use the micrometer tool, change color, add transparency, save screenshots and save to polygonal formats like STL, OBJ, PLY, 3D PDF and Web GL. Removes Bad Geometry: Removes zero length edges, zero area faces, negative area faces, duplicate vertices and duplicate edges, as well as any other unnecessary geometry. Converts Splines to Analytics: Converts spline surfaces to analytic surfaces such as spheres, planes, cylinders, etc., which can be of benefit in downstream operations such as assembly mating and CAM. Stitches Surfaces to Solids: Stitches all surfaces together into a solid model whole as long as they are within a specific gap tolerance. Just click the Auto Repair Wizard button, or pre-select the geometry and click Lite Repair, and it’s done! An IGES surface file becomes a watertight solid model that fast. You can optimize your STL and other polygonal formats for the best mesh density using a wide array of settings. In addition, the Polygon Reduction tool allows you to visually adjust mesh density with a slider while watching the changes in real time. 3D PDF is a relatively new format which allows anyone who has the Adobe Reader installed to open, view, rotate, pan and zoom your 3D part or assembly. The view can include PMI views. With Adobe Reader installed on over a billion devices, that means you can communicate your data to just about everybody. Web GL is a communications exchange format that allows you to view, rotate and zoom 3D models and assemblies, with PMI if desired, right in any HTML 5.0 browser, with no plugins necessary. If anything, the number of people who have access to Web GL via their browser is even larger than the number of users who have Adobe Reader installed. Web GL is also ideally suited for generating parts lists and online parts libraries. Added to all of that, there are tools for Precise Positioning, so that you can build your own assemblies composed of parts from disparate CAD systems, transforming, rotating and aligning parts as necessary, tools for setting up custom named views to further enhance communications capabilities, and 14 render modes for specific situations. TransMagic SUPERVIEW gives you everything you need to open and view any major 3D CAD format, view PMI, make repairs and create exchangable 3D communications formats for internal and external customers. You can read more about TransMagic SUPERVIEW here. If you haven’t already evaluated TransMagic SUPERVIEW, you can request an evaluation copy here.